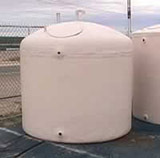 These Fiberglass Water Storage Tanks are a great choice for above ground storage of liquids such as drinking water and rain water, as well as more demanding chemicals or waste supplies. Adaptable and versatile, resins inside these tanks are built-in to fit your specific applications.For instance, if you need to store potable water, your fiberglass water storage tanks will be designed with a resin that will have qualities to allow it to safely store drinking water for consumption at another time. As an added bonus, the fiberglass material is less likely to leave the plastic taste in your mouth after drinking. Multiple resins are also available for different chemical materials. Not	sure	if your application is right for this material? Give us a call! We are always happy to work with you to find the perfect fiberglass water storage tanks for your situation.